I love art installations. I have yet to create an installation purely of my own work, and so I turn to my greater community for help. Thankfully, the congregation at First United Church in Bloomington, Indiana is tolerant of my needs and gladly participates when I ask. This winter, I was obsessed with finding hope. I asked the congregation, as well as the community groups that use our space, to send me images of hope from their cell phone cameras. My comment to them was that unless it was an image of their grocery list or the book they wanted to read, the content was probably something that other people might find hopeful. 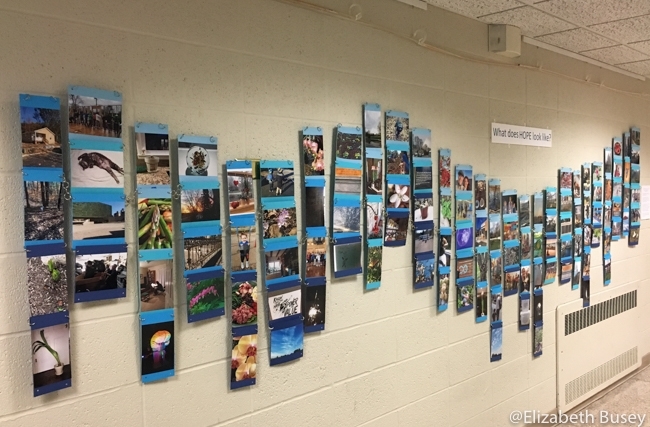 An installation of photographs on blue paper creates a wave of hope in the hallway of First United Church, Bloomington, Indiana. Over the course of a month or so, I received 120 images, which I downloaded and sent off to be printed. My challenge was to combine these images in a way that made a statement, but did not require expensive framing and could be displayed easily on a painted cinderblock wall. 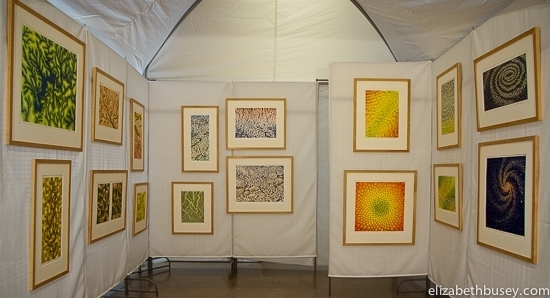 A few years ago, I had seen an installation of solar printmaking using cardboard and small loose-leaf binder rings. I decided to augment this idea to create what I was seeing as “A Wave of Hope.” I purchased four colors of blue scrapbooking paper — thick enough, but not too heavy — along with 500 1/2 inch binder rings. With a newly acquired ATG tape dispenser, I mounted the photos in either a landscape or portrait format on the blue paper. I drilled holes through the stacks of paper, and took the entire set to the site for assembly. With the help of my daughter Hannah, we created a makeshift armature out of dowel rods and the hanging system in the art hallway. We formed chains of imagery, linked with these rings and attached each one invisibly to the armature with fishing line. The chains moved up and down as if they were waves, but were attached to one another so that they did not twist and the entire piece had a bit more stability. I don’t hear huge exclamations when people pass the installation, but they slow down and seem absorbed in the imagery. I think that is what hope is like — it will sneak up on you if only you are open to receive it. If you are so moved– why not attach a hopeful image in the comment section? 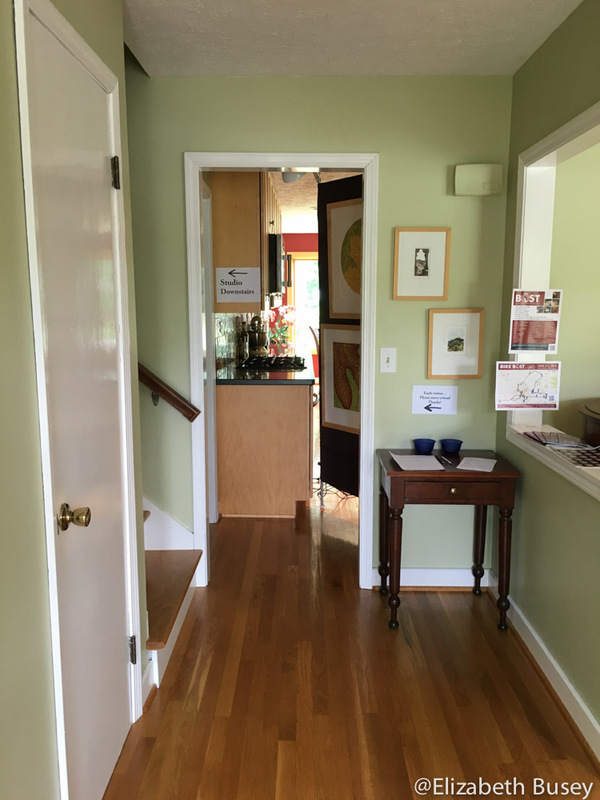 This entry was posted in Experimentation, Inspiration and tagged Bloomington, collaboration, First United Church, hope, Indiana, installation, photographs on June 6, 2017 by Elizabeth Busey. “How do you feel about opening your studio to the public?” was a question from a local journalist recently. 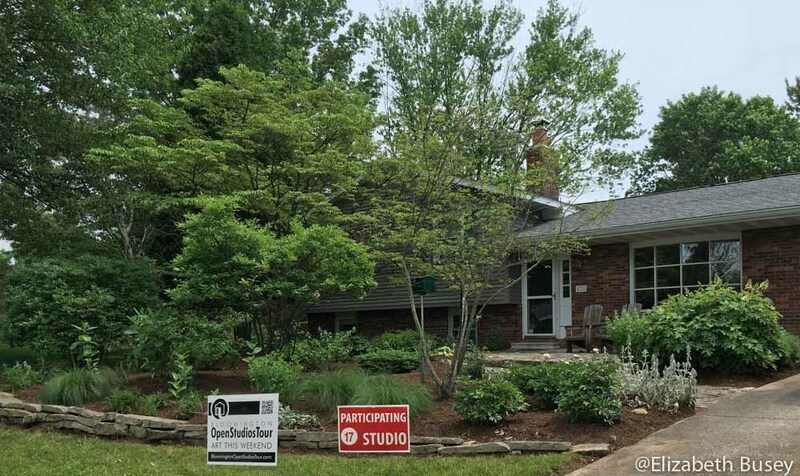 I am on the steering committee of the Bloomington Open Studios Tour which is being held Saturday, June 4th (10am – 6pm) and Sunday, June 5th (10am – 4pm), 2016. When I wrote back, I said that I loved welcoming people to my studio because I enjoy showing what I do. Plus thinking as a business person, I know that people who make connections with the artists are more likely to buy art. You enter into my quad level house, and must descend to the studio. 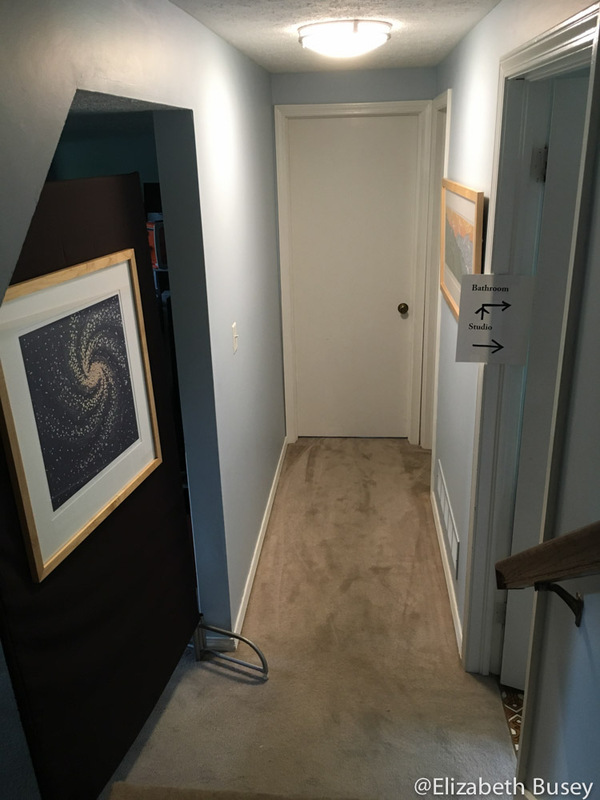 People enter into my 1970’s era quad level house and can immediately go downstairs to see the studio. A display panel helps them not wander into our kitchen/dining room and see the breakfast dishes. Display panels help people not get lost on their descent. A quick turn and people are down half-a-level, guided away from the TV, past my washer and dryer, and into my basement studio. The studio is ready for printing solar flags. Our living room gets transformed into a small gallery. We have turned our living room into a small gallery, complete with framed and unframed work. People can have a quick snack and beverage, rest in the air conditioning and chat with my husband, who is my invaluable assistant for the weekend. Setting up for this event does take some time, but I enjoy being able to share a great deal about my art — and my life — with visitors. My yard, very recently spiffed up by New Leaf Landscaping Consulting. My family and my thumbs so appreciate their work. If you are in Bloomington this weekend, please stop by and say hello. 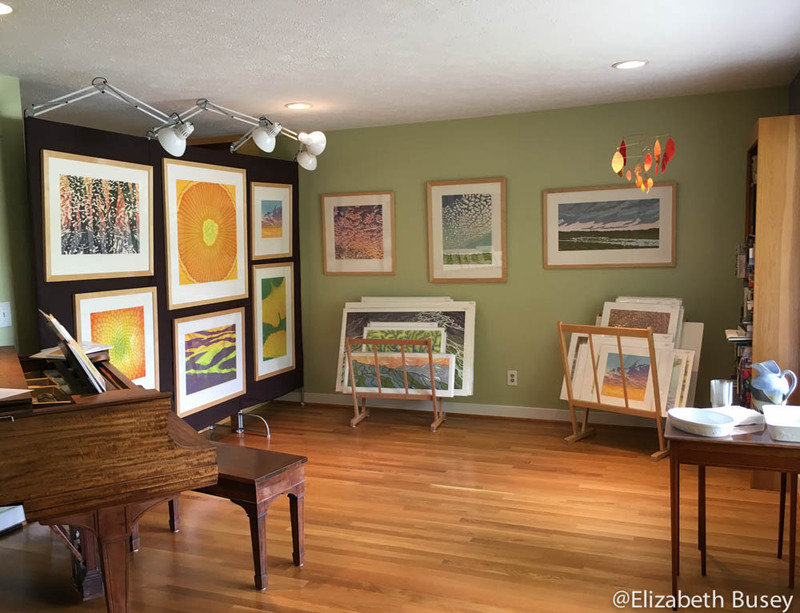 I’m at 4324 E Beacon Ct.
You can find out about all the participating artists at BloomingtonOpenStudiosTour.com. 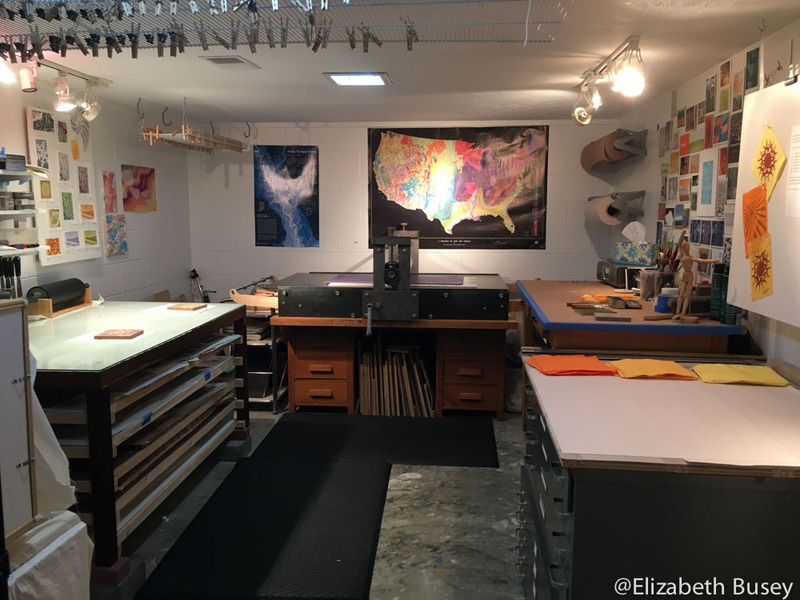 This entry was posted in Open Studios and tagged Bloomington, Bloomington Open Studios Tour, First United, Open Studios, printing, printmaking, solar flags on June 3, 2016 by Elizabeth Busey. I am thrilled to be in the beginning stages of my first commissioned linocut. It is so new, however, that my gradated blue rectangles aren’t ready for blog exposure. My other big project — the Fourth Street Festival of the Arts and Crafts — is coming up soon on Labor Day. So in honor of the festival I thought I would answer some of the most common questions I get about art festivals. Keep in mind that there are always exceptions, and these insights are from my own experience as a festival participant, a festival juror, and local festival committee member. Who chooses which artists participate? If the event says it is a juried art fair, then submissions are chosen by a jury. Most festivals use an on-line service called ZAPP, where images of the artist’s work and a picture of the artist’s booth are uploaded. Jurors only see the images — no names or other identifiers are allowed — so it is hoped that the process can be without favoritism. Jurors see artwork by category (i.e. jewelry, ceramics) and give each submission a numerical score. The festival then uses these raw scores to develop their list of invitees. They keep in mind how many of each type of medium they would like to have. There are usually many more jewelers, ceramicists and photographers than there are say, printmakers. They want to make sure the festival has a good variety of offerings. Being a juror can be a tough job. Some festivals do live jurying — where the jurors look at the images together for a brief time and then submit scores. I did this for the Broad Ripple Art Fair one year, and it was exhausting to look at so much art! Other festivals allow jurors to score on-line over a period of time from any location. My first booth shot came from an early January mock set-up in my church hall. Where do all those white tents come from? This entry was posted in Art Festivals and tagged art displays, art fair tent, art festivals, Bloomington, Columbus, Fourth Street Festival of the Arts and Crafts, Indiana, Ohio, severe weather on August 13, 2015 by Elizabeth Busey. Get out of your studio! Get in your studio! These push-pull messages are always with me as I decide how to spend my art time. We have been inside for most of June, as my area of the country has had record rainfall. As the sun began to peek out, I quickly kidnapped my husband from his nearby university office and we went out to the Indiana Limestone Symposium held on the grounds of the Bybee Stone Company in nearby Ellettsville, Indiana. One of may favorite things to do, when I am not carving a new linoleum block, is watch other people creating — especially those who work in 3-D media. I find ceramicists and glass blowers fascinating. 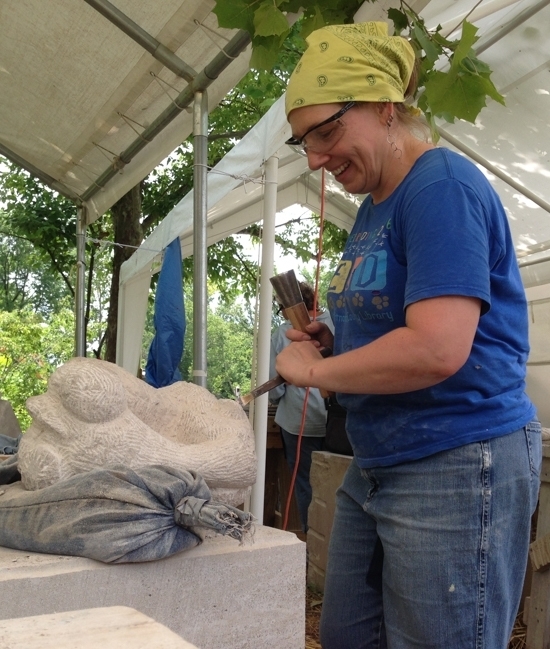 I have lived in Indiana’s limestone belt for over twenty years, and I wanted to see how stone carvers coax life out of our fossilized sea beds. 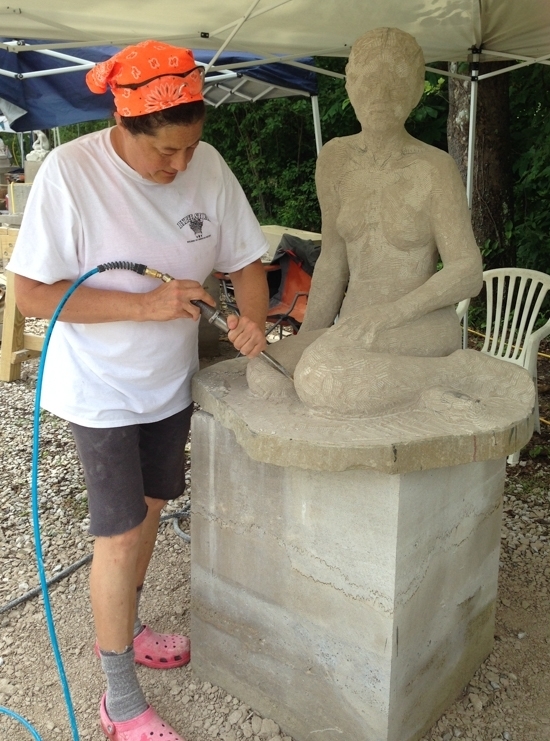 Amy Brier uses an air chisel to free this figure from the limestone. As she carved, the noise from the compressor was loud, but the carving looked surprisingly soft. The grey stone only hints at the entire ecosystem that lived and died in this place, giving us the material that we have used to create structures both grand and mundane. Amy talks in depth about her love of limestone in her Bloomington Tedx talk. 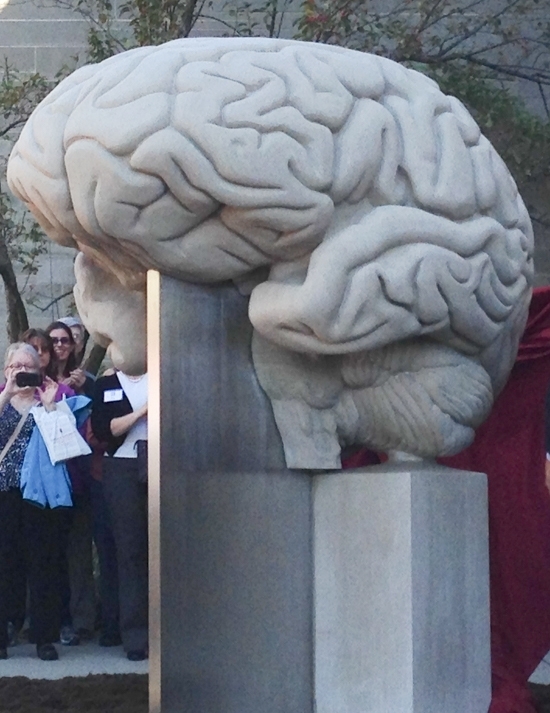 She also designed the world’s largest anatomically correct brain that now resides outside Indiana University’s Department of Psychological and Brain Sciences where my husband works. Visit this sculptural brain at the Indiana University Department of Psychological and Brain Sciences at 10th & Woodlawn in Bloomington. Visit it after dusk for an interactive light show. I chatted with site director Delaine Gerstbauer about the challenges of deciding what to carve, and what to allow the viewer’s own visual system to complete. When is an incompletion a hint of something else, and when is it an error? This is a question I ask myself all the time. Too much and the work is to literal or static. Too little and the entire image is confusing and frustrating. How much of “anything” should be carved away? Wht cn yr brn rd nywy? I not only observed seasoned stone carvers at this event, but I also saw a noted neuroanatomist and a beloved local singer/songwriter, each lost in the creation and destruction of the carving. I decided since they were clearly there to stretch their creativity, they didn’t need me outing them, or acting like a groupie. I doubt I will ever have need of such anonymity, but I thought I would extend it to them. One person I did chat with was glass artist Abby Gitlitz. I asked her about the differences between blowing and working her glass, as opposed to her hand sculpting a limestone block. She said that working in a different media helped her to get her creative juices flowing. We both wondered about the possibilities of combining her colorful glass with the quiet mat textures of the limestone. Glass artist Abby Gitlitz uses a hand chisel to coax a form out of a limestone block. Getting the creative juices flowing is so important, especially after you have worked very hard for a period of time. I’m taking baby steps with a new small linoleum block, and enjoying using my Iphone camera to capture images of inspiration. Perhaps next year I will schedule a few days at the Limestone Symposium and try my hand at relief carving in a whole new way. 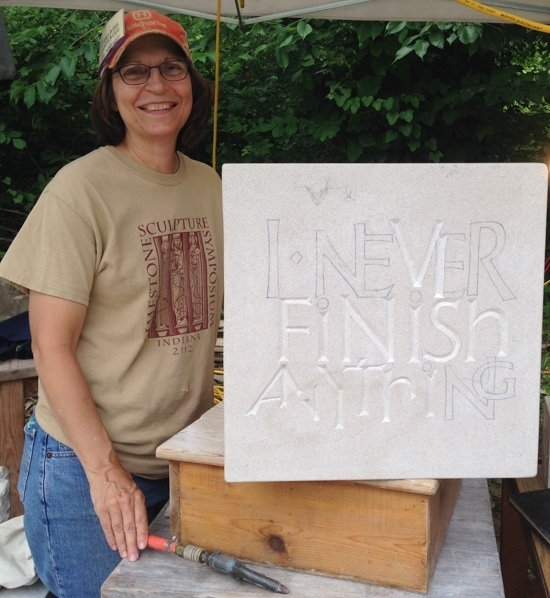 This entry was posted in Inspiration and tagged Abby Gitlitz, air chisel, Amy Brier, Bloomington, Bybee Stone Company, carving, creativity, Delaine Gerstbauer, Indiana Limestone Symposium, Indiana University, limestone, media on July 3, 2015 by Elizabeth Busey.